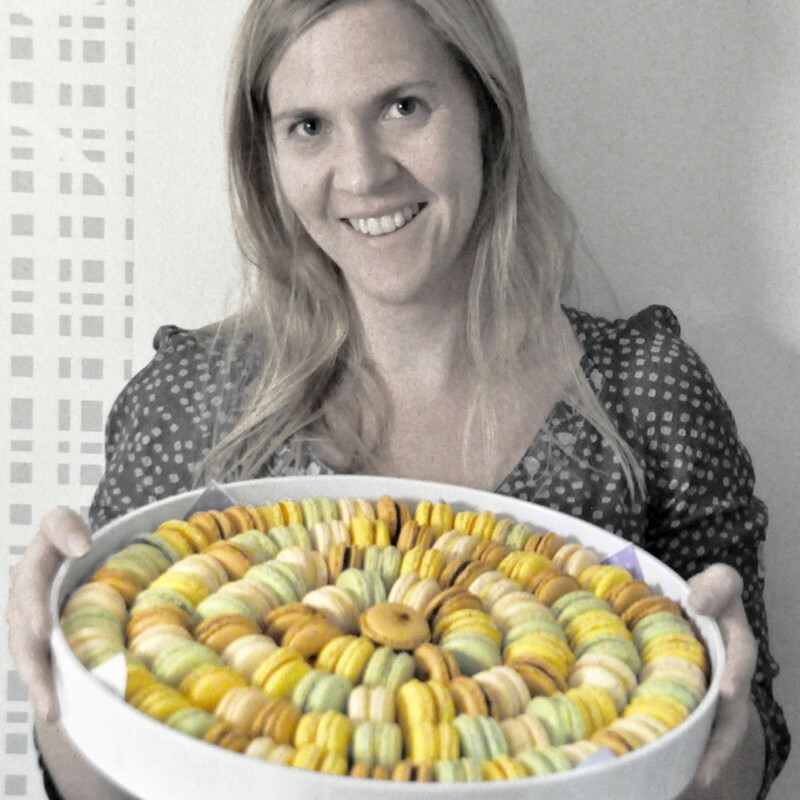 How to make French macarons? If you search the web or read in cook books, the impression you get is probably that it is difficult to succeed with these small delicacies. My experience is that it is not at all true! You can take many short cuts and still end up with a great result. You may have read about egg whites that have to mature in room temperature for days? Blanching almonds and grinding them? Making sugar syrup? Trays that have to wait hours before you can put them in the oven? Pinching the macarons with tooth picks, or even using a hair dryer on them before cooking? Some things are important for getting a good result when it comes to macarons, but other things you can just skip. Here is how I work to create these wonderful mouthfuls. Sift the powdered sugar and the ground almonds into the meringue using a shaker. Do you experience bits of almond left in the shaker? Put them back in the blender for an extra spin, and sift them into the meringue. Fold the almonds and powdered sugar into the egg whites. The trick to get perfect macarons lies in the folding; don’t fold too much, and don’t fold too little. If you fold too little the macarons become small meringue peaks (too airy). If you fold too much, they batter will get runny, and the result is flat macarons. The folding process is so important that it has its own name in French: macaronage. To master the technique, the best advice I have is to just try. For each time you will get more experienced, and you will become better in deciding when you have folded enough. The thing to look for is that if you leave the batter for around 30 seconds, the contours from the folding should start to even out and disappear. Put the template underneath the baking paper covering your tray. Tip! The template and the baking paper need to lies completely flat on the tray. Fold or cut away excess paper. If not, you risk that the batter will run and the macarons will get odd shaped. Add the batter to a piping bag with a round tip. If you put the piping bag in a tall glass or measuring cup, it is easier to fill. Pipe out small amounts of macaron batter onto the baking paper (covering the template). Remember that the batter will run a bit, so don’t add to much batter for each macaron. Leave the tray for a couple of minutes, remove the template carefully, and put the tray in the oven. I turn the oven on 150 degrees Celsius (300 degrees Fahrenheit), and bake the macarons for 14 minutes. The correct cooking time will depend on your oven. Anything from 12 to 15 minutes could be the right timing. After a couple of tries, you will figure out what works well with your oven. 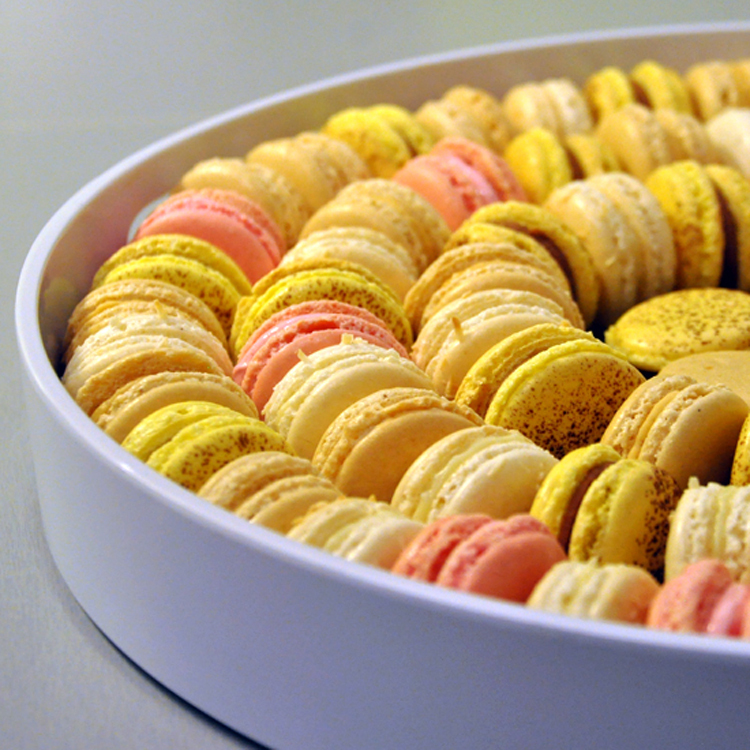 Remove the macarons from the oven, and let them cool before you remove them from the baking paper. If you have baked the macarons too little, they might stick to the paper. Use a knife to cut them loose. The macarons should be crispy on the outside and with a soft (sticky) center. If the macarons have turned out crisp all the way through, you have baked them too much. Next time, reduce the cooking time, and you will get perfect macarons! Anyway, if you now have perfect macarons, macarons that are baked too little or too much, you have some great tasting cookies to fill with your favorite filling! Use a teaspoon, a knife or a piping bag (choose the one you prefer), and add 1/2-1 teaspoon of the filling to one of the macaron shells, before you top it with another macaron and sandwich them. For filling recipes, check out the recipes on the blog, search the web, read books, or experiment yourself. Enjoy!